If you frequently attend a fitness gym, you know that you have a goal. You want to lose weight or gain muscle mass. Sometimes, you may require the assistance of a trainer to meet these goals. You are aiming for continuous improvement of your physique or health. With a manufacturing process, you likely don’t want to aim at just meeting your quota – you want to take on new clients and surpass your goals to make more money for everyone who works on your shop floor. This is where solutions such as machine monitoring, job scheduling, and DNC can come in handy towards the goal of continuous improvement in manufacturing. “Continuous improvement, sometimes called continual improvement, is the ongoing improvement of products, services or processes through incremental and breakthrough improvements,” states ASQ, a global knowledge network in America dedicated to improved business management tactics. 1 – Implement Machine Monitoring. Collecting and processing real-time data from machines is extremely valuable in manufacturing. Getting emails or text notifications when there are issues with production is crucial to making sure the Made in America movement is on its game. Having accurate production data can help make better-informed decisions about machine utilization and can often be integrated with other programs or hardware. 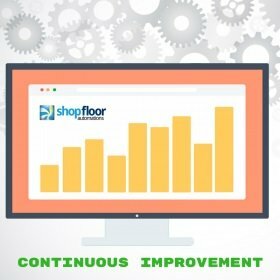 Especially with the $45 per month, per machine Cloud option from DataXchange, it is certainly more affordable than most shop floors expect! FYI – DataXchange can also be integrated with Bigfoot CMMS for plant maintenance. 2 – Utilize Job Scheduling. A real-time graphical scheduler will not only replace outdated spreadsheets, but it can also accomplish such tasks as tracking jobs and helping you move them to another machine with less utilization when there is unexpected downtime. It can help you redirect the time you would have spent manually updating and filing spreadsheets on other pursuits. Also, even though it’s not a crystal ball, a job scheduler such as JobPack will allow you to see up to 365 days into the future for scheduled jobs. 3 – Adopt DNC Software for CNC Communications into your routine. Why manually manage and send programs? What if programs are too large to download at machines for operators? You can have revision control and spend less time either running back and forth from a PC, or bringing a laptop from machine to machine. Don’t just hope for a program to send to a machine, or rely on switchboxes, or worry about constantly replacing RS232 cabling. Interested in any, or all, of the solutions above? We are ready to help you achieve your continuous improvement goals. Call (877) 611-5825 or fill out a contact form. You can also read our many Customer Testimonials to see for yourself the benefits of our solutions.